A man has been found guilty of murdering his girlfriend hours after making a New Year resolution never to hurt her again. Myles Williams, 19, of Hackney, east London, was convicted of killing Kirsty Treloar, 20, and wounding her brother and sister, who tried to defend her. Miss Treloar was stabbed 29 times by Williams, just three weeks after she gave birth to their baby. He will be sentenced on Wednesday at the Old Bailey. On 1 January, Williams, of Pond Farm Estate, sent Miss Treloar a text message saying: "Okay wer all gud now and my new yrs ressy is that i aint going to hit u again and i won't hit u 4 this yr next yr the yr after that the next yr after that." He went on to say he wanted her to swear on their daughter's life she wouldn't do anything to make him angry before ending the message with "love you 4 eva". Crispin Aylett QC, prosecuting, said: "This can only be described as a conditional New Year's resolution. It lasted only until the following morning." Seven hours after sending his text, Williams received a reply at 06:30 GMT on January 2 from Miss Treloar saying she did not want to see him. Williams then broke into her family home in Brownlow Road, Hackney, east London, and launched the knife attack on the trainee nursery nurse. When her brother Dean, 23, and sister Gemma, 24, tried to help, they were also knifed. Mr Treloar was stabbed in the chest, while his sister was cut on her arm, said Mr Aylett. Kirsty Treloar was dragged into Williams' car. Her body was found behind wheelie bins near the abandoned car two miles away. Williams claimed he could not remember the attack. Det Ch Insp Andy Yeats said it was "an appalling and violent attack by an individual with a propensity for violence towards women". 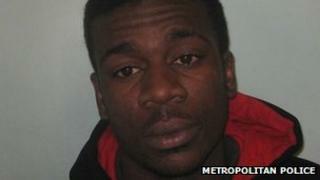 He added: "Kirsty's murder was the result of her simply not wishing to see him that day. "Williams's response to this was savage and extreme, not only towards Kirsty but towards members of Kirsty's family who tried to save her life." Miss Treloar's mother Pamela said in a statement after the verdict that Williams had devastated a close family. She said: "Myles Williams has taken a decent, loving, close family and ripped us up." She said her daughter had a "heart of gold" and could not wait to start her life as a new mother. "She called her daughter her little princess. We will one day have to explain to her what happened to her mum."